William and Mary wrapped up a three-match road trip when it squared off with Elon Wednesday night, Oct. 24. The Tribe entered the match having lost its previous five Colonial Athletic Association matches. 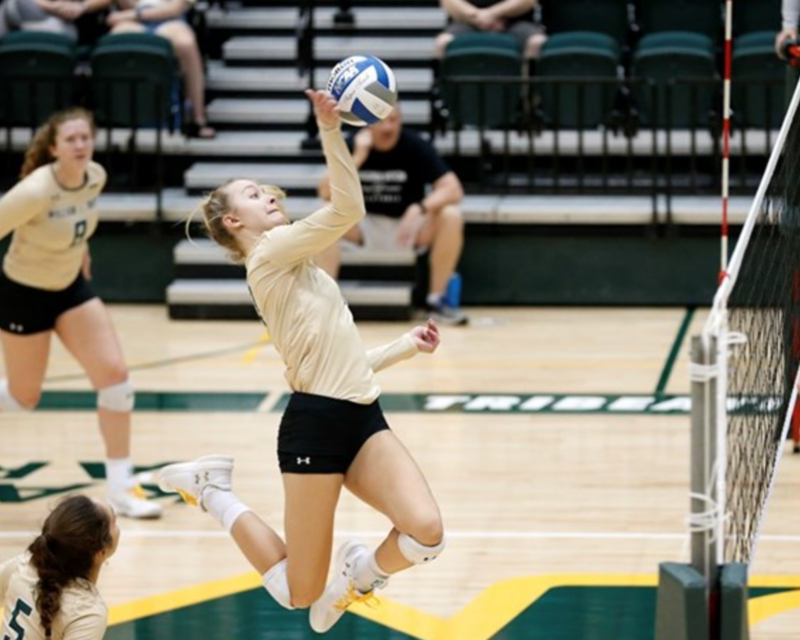 The College had only won two sets in its eight CAA losses and had not claimed a set so far on the three-match road trip that included matches against North Carolina-Wilmington and Delaware. The Phoenix got off to a slow start in conference play, but came into Wednesday night on a four-match winning streak, including three CAA wins. One of those wins was a 3-1 victory over the Tribe in its first meeting of the 2018 season Oct. 14. Wednesday, the College came from behind to claim the first set, but it was unable to maintain the lead as the Phoenix won the next three sets to win the match. The College started slowly in the opening set, falling behind quickly, 5-2. The Phoenix were not able to stretch their lead enough to put the first set away, despite taking a 10-6 lead at one point in the set. The Tribe recovered to grab seven of the next 10 points and tie the score for the second time in the set, 13-13. The Phoenix responded with a run of their own to prevent the College from seizing its first lead of the set. After reeling off three-straight points to regain a 16-13 advantage, the Phoenix let the Tribe back into the set once again. This time, the College seized the opportunity and took five of six points to claim an 18-17 edge late in the first set, in the midst of a seven-point run that allowed it to claim the first set, 25-22. Freshman outside hitter Lauren Merrill had the kill that put the Tribe on top, as well as the hit that capped the seven-point spurt. The College opened the second set looking to win multiple sets in a CAA match for just the second time this season. The set started out as a back-and-forth affair, but the Phoenix came out on the winning end of a couple of long rallies to pick up some momentum and take a small lead, 9-6. The Tribe managed to inch its way back within one point in the middle of the set, but the Phoenix did not give up their lead like they had in the first set. They stretched their lead to as much as six towards the end of the game, ultimately claiming the second set 25-20 on a kill by middle blocker Elizabeth Coil to even the match at one set apiece. The two teams went back-and-forth once again in the third set, but the Phoenix were able to produce a decisive run late in the set, despite dropping the first set. The College had evened the match at 13 before the Phoenix threatened to take control of the set with a three-point burst. However, back-to-back kills by sophomore middle blocker Julia Brown and freshman outside hitter Claire Farrell pulled the College back within one point. Nevertheless, the Phoenix responded by winning nine of the final 11 points of the game to cruise to a 25-17 in a critical third set. The College attempted to rally in the fourth set and force a fifth set for the first time since its lone CAA victory over Delaware. Farrell started off the set with a kill to give the Tribe its first 1-0 lead in a set on the evening. However, its early lead faded and the College spent most of the set playing from one or two points behind the Phoenix. The Tribe was never able to manufacture a scoring run in the fourth set and the Phoenix eked out the set, 25-22. The Phoenix claimed a 3-1 victory in the match after dropping the first set, in order to win their fifth-straight match and their second of the season over the Tribe. The Phoenix were led in their comeback by outside hitter Kellyn Trowse’s 12 kills and 12 digs. They also received a strong effort from setter Kodi Garcia, who added 41 assists. The College was led in the loss by Merrill’s match-high 18 kills, along with 15 digs. Senior setter Katie Kemp contributed a match-high 50 assists, while sophomore libero Lauren Moussaid chipped in a match-high 21 digs for the visiting squad. The Phoenix will conclude a three-match homestand with matches against Northeastern and Hofstra Friday and Sunday, respectively. The College will return to Williamsburg this weekend for two matches against CAA opponents, looking to snap a six-game losing streak. Four of the College’s final six matches will be played in Kaplan Arena.